We bought the Seamaster 30 “Glory Days” at a bargain price, that said it was kind of mankey dirty. There were cloths in the wardrobes covered in mould and one leather jacket that had mushrooms growing on it.You have to be able to see past the dirt with boats and see what you can make out of it. She was called Glory Days after the Bruce Springsteen song, well I presume that bit. 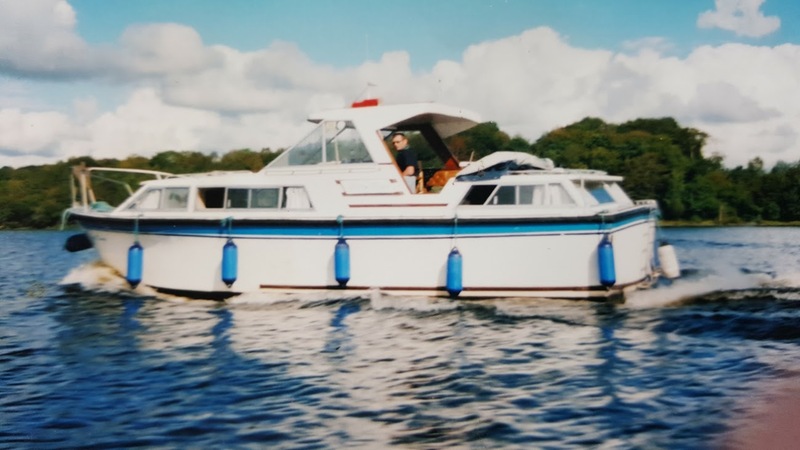 The Seamaster 30 was a great boat and we all loved it. It had what they called an aft cabin and we put a permanent bed in it so we didn’t have to take a table down to make up a bed every evening. The Seamaster 30 normally has twin engines. But our one had been made for the hire market and as such it had just one Perkins diesel engine. 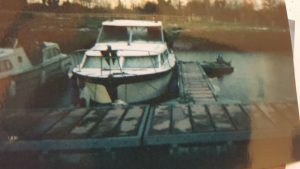 They said that Perkins engines last forever and for ours forever arrived one day while we were taking six pensioners out for a spin on the river. The engine ceased up tight and we had to drop anchor and off load our elderly passengers onto another boat. It was a risky manoeuvre but we didn’t loose any of them, don’t think we did anyway. We got towed back and lifted the boat out. I converted an old Ford Transit engine with a marinising kit and a new gearbox. 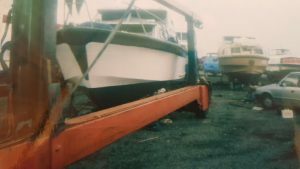 Re-engining a boat is a complex task and most things that can go wrong probably will go wrong. After much work and even more money we had Glory Days our Seamaster 30 up and running again. We had Glory Days for another few years before Marion happened to spot “Driftwood” in a marina in Athlone.